April of this year marks nine years since welfare rates – still frozen at $610 a month for a single person – have gone up. Although the provincial government plans to increase disability rates by $77 a month in September, they also plan to begin charging people who receive the disability pension $669 a year for a bus pass that they now get for $45 a year. This means giving with one hand and taking with the other, and the decision has enraged the many people trying to get by on meagre benefits across this province. 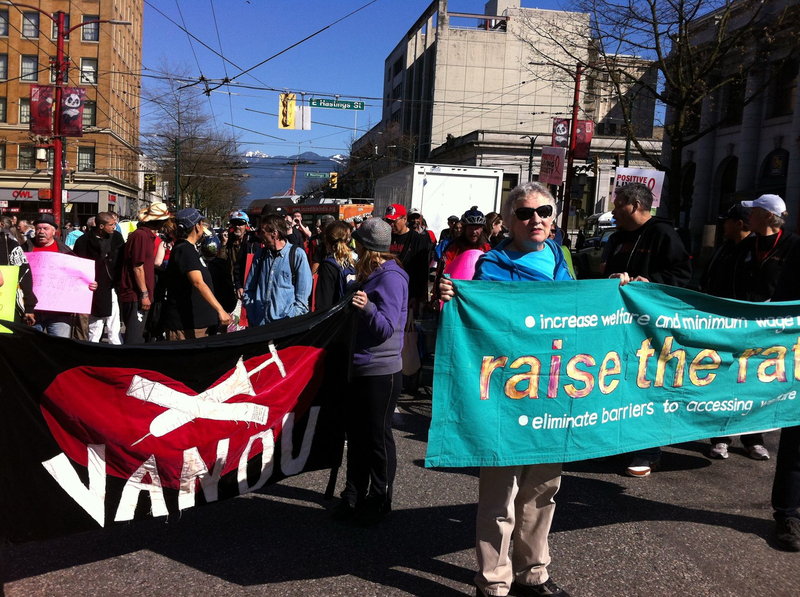 To call for higher rates and to restore the bus pass, hundreds rallied last week in the city of Vancouver. Marchers gathered at Main and Hastings before heading to Thornton Park. Western Aboriginal Harm Reduction president Tracey Morrison was among those who spoke at the rally. “We need to ally together to end the poverty and discrimination that we face everyday so we can eat,” she said to the crowd of about two hundred. A wide range of groups across the province also came out to the support the movement. A representative of the BC Federation of Labour came to show solidarity with the struggle for higher welfare rates. “The Fight for $15 is in solidarity with the struggle,” said Denise Moffat of the Fed. “Nine years is too long for people to wait for an increase.” Tom Page of ACORN also called on everyone to know their rights, share a vision, and take action, while Neil Self of Positive Living BC called on the government to raise disability rates to the same level as currently exists in Alberta, at over $1,500 per month. “People shouldn’t have to choose between housing, food and health care,” he explained. Colleen Boudreau added that nutritious food should be a right, not a privilege or an act of charity. Posted in Downtown Eastside, Homelessness, Transit. Bookmark the permalink. Now if all of the religious and other charitable organizations publicly joined in! Remember you are tax exempt organizations because of the work and beliefs you ascribe to. Protests need to be held outside Vancouver, like in the Fraser Valley, as many people are too disabled and/or too poor to attend rallies in Vancouver.